The species has a scattered Distribution: in Britain as far north as central Scotland, but is absent from some large areas of the country. It is widespread in western and central Europe, but the species has not been recorded from Ireland. 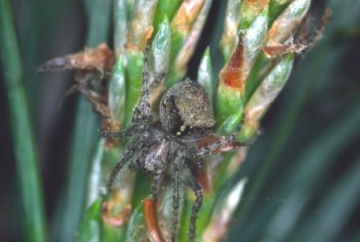 The orb webs of this spider are most often found on evergreen trees and shrubs in scrub or old woodland. In Leicestershire the species has been collected from yew and other evergreens in urban and suburban churchyards and parks (J. Daws, pers. comm.). The adults are found mainly in May and June with some females surviving through to late summer. Generally uncommon but the spider may be present in large numbers where it is found.